You don't have to be an environmentalist to dislike air travel: the noise, the smell and the millions of tonnes of combustion products injected into the atmosphere around the world every day. All that is going to change – sooner than you think. In recognition of the dramatic changes that lie ahead, the engineers of the Fuel Cell division at Airbus have just been awarded the prestigious Innovationspreis der Deutschen Luftfahrt 'Innovation Prize in German Air Transport' in the category 'Emissions Reduction' for their work in developing hydrogen fuel cell power systems for aircraft. 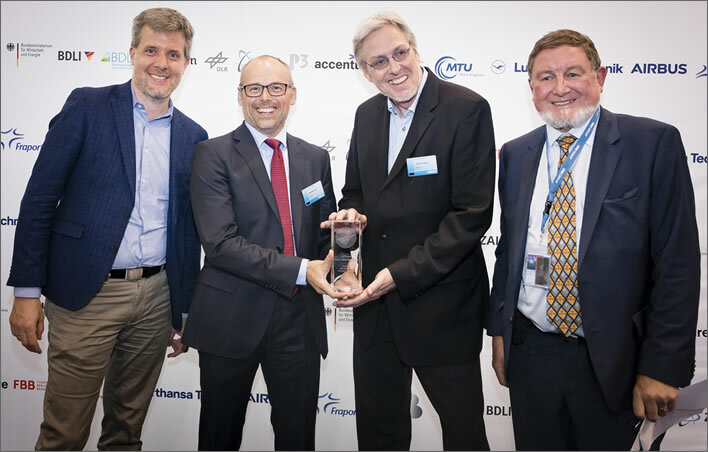 Barnaby Law, Program Director Hydrogen and Fuel Cell Airbus (centre left) und Claus Hoffjann, Expert Integrated Fuel Cell Airbus (centre right) receiving the Innovation Prize in German Air Transport in Berlin on 25 April 2018 from Dieter Janecek (left) Member of the Parlimentary Committee for the Economy and Energy and Professor Ric Parker, Chairman of Clean Sky (right). Image: P3 Group, CC0 Public Domain Licence. These are not merely green dreams or hopeful speculations. The jury specifically noted that all the technologies and components were practicable and that the first demonstration devices already existed in Airbus. In effect, the Airbus team has laid down a practical development pathway which will lead to a revolution in aircraft power supplies and propulsion systems using clean and safe hydrogen. Safe? As safe as any other fuel. Technical developments in recent years now allow hydrogen to be handled and used with great safety, certainly as safely as fossil fuels. Its reputation as an unusably dangerous explosive gas is no longer justified. 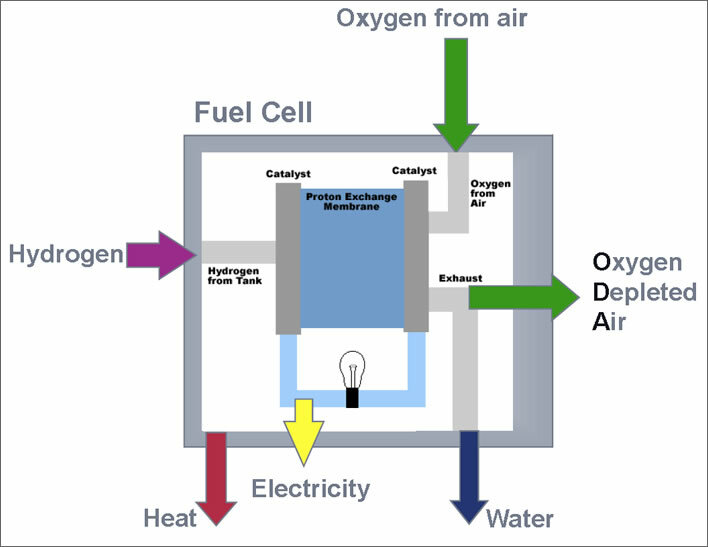 A fuel cell makes electricity out of hydrogen in a completely clean process that leaves only pure water and de-oxygenated air behind. The award of this prize is an acknowledgement that the world is standing on the edge of a technological revolution. Using the fuel cell means that the deal we make with the pollution devil in exchange for the convenience of air travel will soon be unnecessary. Fuel cell principles. The inputs are gaseous hydrogen and oxygen from the air; the outputs are electricity, heat, water and oxygen depleted air (ODA). Image: Airbus. Two steps will lead to this revolution. The first is the development and use of an aircraft Auxiliary Power Unit (APU) driven by hydrogen fuel cells. This step should be completed within a decade or less. The second is powering the aircraft propulsion system with hydrogen fuel cells. This step should be in commercial service in something like ten to twenty years. 'Twenty years!' you say. The purely engineering development will be much quicker – what will take the time is the implementation and deployment of the hydrogen fuel cell system in an industry based on the immense consumption of fossil fuels. That process will involve politics, international regulatory standards and the creation of new infrastructure across the world. Kerosene powered aircraft are rolling off the production lines every day and will do so for some time to come; aircraft that have each cost possibly hundreds of millions of dollars will take decades to amortise. The first step is a bigger deal than it sounds. The APU supplies the electrical power and compressed air which is needed for the on-board air conditioning and to start the main engines. Once the engines are running the APU is shut down. In the extremely rare case of a catastrophic engine failure, electrical power provided by the APU can keep the avionics running, but the start up time with traditional APUs in these circumstances can be up to 30 seconds. The APU is an unpleasant beast, usually based around a turbine to minimise weight. It is hot, noisy and smelly. Operating at an efficiency of under 20 percent, it guzzles fuel and spews out filth. Because of this, in many airports its use on the ground is severely restricted to the short periods necessary to start the engines. At all other times the aircraft has to rely on a ground power supply. Unfortunately, traditional portable ground power supplies are not so much cleaner or quieter than their onboard brothers. They also need to be in the right place at the right time. The APU is not only unloved by airports, it is unloved by airlines because of its high operation and maintenance costs – they would be happy to see it replaced with something more economical. An onboard hydrogen fuel cell APU solves all these problems at a stroke: no more disgusting emissions; extremely quiet, easy and cheap to maintain; rapid startup. And all that means – best of all – no APU ban at the airport. The aircraft can operate completely autonomously without the need for external power sources to be connected up. Passengers and airlines will notice the advantages immediately. The APU will be transformed from a polluting nuisance that is run as briefly as possible into a quiet and clean device that will run during the entire flight. This is because fuel cells produce two by-products that make their use in aircraft even more attractive. They produce a supply of water of drinkable quality. This alone will save, depending on the size of the plane, between 150 and 700 kg of take-off weight. They also produce Oxygen Depleted Air (ODA). This can be used for fire suppression in cargo holds. The traditional solution, Halon, has been banned by EU environmental legislation, so a fuel cell system will bring a replacement for this safety feature. The second step will revolutionise commercial air travel completely. Within two decades it will be possible to power the entire flight with hydrogen fuel cells supplying an electric motor turning a propeller. What? Back to propeller planes? Yes, why not? Admittedly, propeller aircraft fly more slowly that jet aircraft, but not so much slower that it makes any practical difference on the vast majority of aircraft flights – a matter of a few minutes on journeys that now take around a couple of hours. Much more time from the start to the finish of a journey is typically lost in air traffic management and passenger handling compared with a few minutes longer on the flight time. Propeller aircraft are still in use around the world and are valued for their high efficiency compared with jet aircraft. Fuel cell aircraft would be immediately suitable for the relatively short-hop routes that make up the majority of modern aircraft traffic. Extremely quiet, extremely efficient and extremely clean – no hydrocarbon combustion emissions, in particular no CO2, no NOx, no combustion residues, low heat signature, no aerosols and thus very low to no generation of condensation trails. The millions of people living around airports will be even happier than the millions of passengers flying between them. High altitude, fast, long-range wide-bodied jets still have a future for the moment but there are already designs that promise to bring the thrust of jet engines to electric motor drives. The breakthrough that will make all this happen was made a few years ago by engineers of the Hydrogen and Fuel Cell Division at Airbus in Hamburg. They solved the great problem: the fuel cells exist, the motors exist – all the technology is known and thoroughly understood – but how do you connect it all together? In particular, how do you handle the immense low voltage currents that require thick and weighty cables and massive circuit breakers and electro-mechanical controls? As power demand and currents rise, the difficulty of transmitting low voltage electricity along cables becomes overwhelming. Even battery-driven electric cars have to find some way of cooling the cables that connect the batteries to the drive motors. The heat generated by the electrical current is not only difficult to handle and disperse, it also represents an appreciable loss of energy. The breakthrough made by the Airbus team is the integration of the fuel cell into the electric motor. Multiple fuel cells are built directly into the outer stator of the motor and connected up directly to the windings. 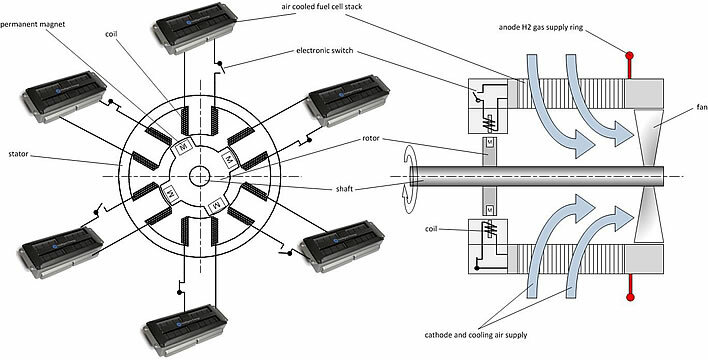 The fuel cells and the windings are connected up in such a way that there is a large measure of redundancy: should one or more of the fuel cells stop producing power for whatever reason, the motor will still be turned by the remaining cells. Top: A schematic drawing of the combination of fuel cells and engine windings in the stator and a fan connected to the rotor. Bottom: another possible configuration in which the fanblades themselves are the rotor. The stator with the windings and control electronics are in the green segment, the fuel cells are in the grey segments. Images: Airbus. 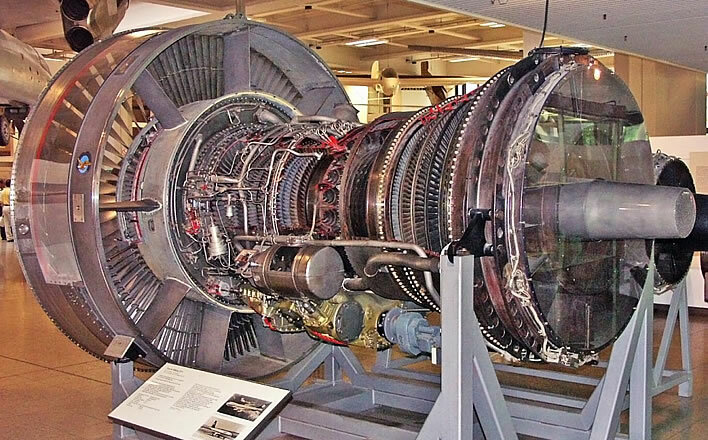 The simplicity of the fuel cell design can be contrasted with the complexity of the jet engine, in this case the rotor of a Pratt and Whitney JT9 turbofan engine in the Deutsches Museum in Munich. Image: Deutsches Museum München. Simple electronic switches at each fuel cell are able to create the alternating power flow that drives the motor (much like the commutator and brushes in a normal motor). At no point does any single component have to deal with the full current of the motor, meaning that the whole construction is extremely light. The only energy flow into the engine is tube carrying hydrogen gas. This step also increases even further the advantages of the use of fuel cells over batteries in aviation. Unless there is some remarkable and completely unforeseen increase in battery performance, batteries will always be too heavy in aircraft. Even if their weight could be reduced they will still require large cables and weighty electrical systems, putting them at a permanent disadvantage to fuel cells in aircraft use. 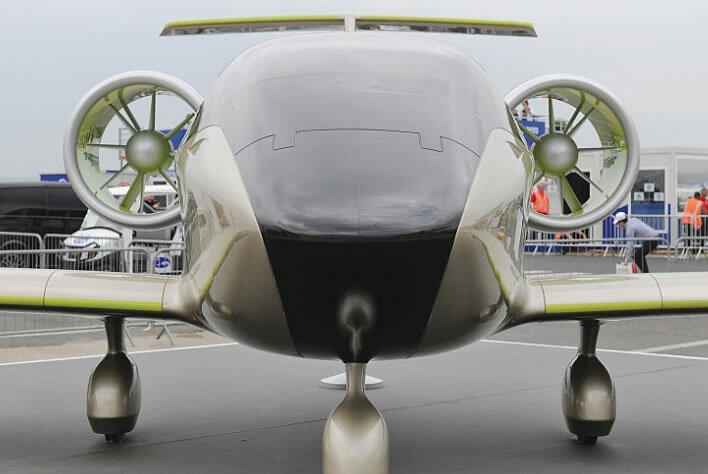 The Airbus E-Fan, a battery-powered test aircraft with electric motor propulsion. Heavy, with limited payload and range. Image: Airbus. In the midst of all this euphoria, there is one technical problem that will still need some brainwork: hydrogen storage on the aircraft. Without going into all the details, the best form of hydrogen storage for air transport is cryogenic Liquefied Hydrogen (LH2). For the same energy content, kerosene weighs 2.8 times as much as LH2 (Hooray!). Unfortunately, LH2 takes up 4 times the volume of kerosene (Oops!). It also needs to be stored in refrigerated pressure vessels kept at around -253°C that can cope with a pressure of about 2 bars. Because these vessels are pressure tanks they will need to be spherical or cylindrical, which means that they cannot simply be fitted into the form of the wings like present day kerosene tanks. 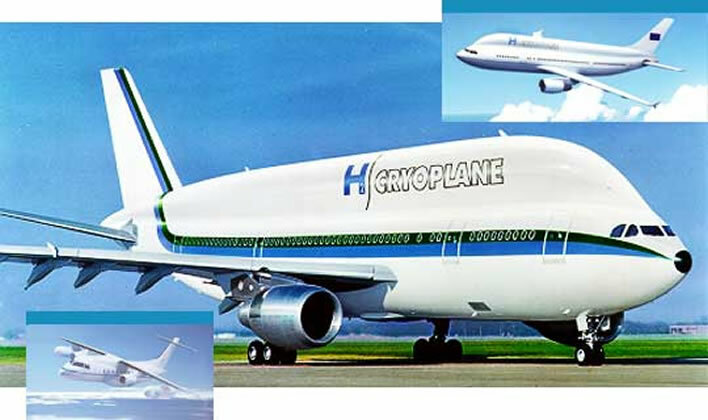 The Airbus Cryoplane study, in which conventional turbofan engines are fuelled by hydrogen instead of kerosene. The huge volume required for the storage of the liquid hydrogen is apparent in the distended appearance of the fuselage. Image: Airbus. The good news is that power generation by fuel cells used in electric motors is inherently more efficient than blasting kerosene into jet engines, so that the amount of fuel required is less. Nevertheless, someone will need to do some pencil chewing on this problem. That is also the reason that the first step in the use of hydrogen fuel cells in aircraft will be the integration of a fuel cell APU. 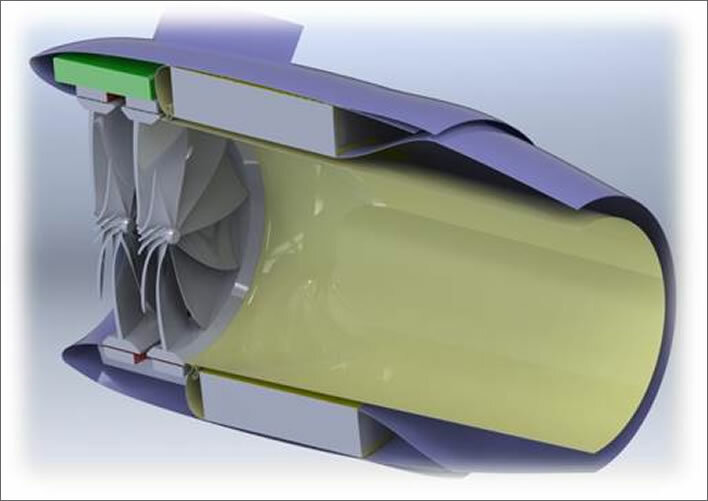 The storage of the hydrogen required for this is a relatively simple problem that can be solved by the use of a simple insulated pressure vessel in the fuselage of the plane. An Airbus study for the installation of a tank for LH2 fuel for the APU in the tail of an otherwise conventional aircraft. Image: Airbus. As far as the overall development pathway is concerned, the same technology of the integrated fuel cell and motor can be used for the APU as well as the aircraft engine, meaning that the engineering development of both can proceed side by side. Airlines adopting the technology will be particularly happy that they will be using a fuel that comes from multiple reliable sources at stable long-term prices which do not depend on the whims of someone pumping oil out of the ground. There are a number of production processes for hydrogen in quantity, meaning that hydrogen consumers will always have a choice of supplier. Hydrogen is a by-product of some industrial processes. In some places it is currently being burnt off into the atmosphere as a waste product. As the Berlin prize jury emphasised, all this technology exists today. The high-performance fuel cells are available and test-bed models are working today. This is not the type of speculative technology that we have seen in so many other environmental developments. The Airbus team sees a clear development stairway leading to the realisation of these systems. The Airbus team is confident that the hydrogen fuel cell APUs will be in action in at most ten years. That in itself will be a great step forward for air transport. Fuel cell flight may take twenty to thirty years to emerge, but emerge it will. A day will come – sooner than you think – when the huge air and noise pollution of air travel will be a thing of the past. One day we might begin to feel good about flying again. An early Airbus study for a hydrogen fuel cell powered aircraft. Image: Airbus. A few small corrections were made.